UPDATE IV: "It’s a long-running talking point spouted by Trump administration members and the president himself: Undocumented immigrants are taking jobs away from black and Hispanic Americans. . .
Here’s the problem: immigrant and native-born workers are imperfect substitutes. There is no evidence that the unemployed Americans, be they black, white or Hispanic, have the skills necessary to hold the same jobs occupied by the young beneficiaries of the five-year-old Deferred Action for Childhood Arrivals (DACA) program. . .
'Cannibalizing stigmatized and marginalized groups against each other serves the wealthy interests that benefit from such divisive colonial and labor segmenting tactics,' [Darrick Hamilton, an economics and urban policy professor at The New School] said." Read the Washington Post, White House claims ‘dreamers’ take jobs away from blacks and Hispanics. Here’s the truth. UPDATE III: "President Trump’s decision to rescind the Deferred Action for Childhood Arrivals program was both unsurprising — given the campaign he ran — and politically perilous. It also highlights a divide that goes deeper even than immigration, one we can see in vivid detail in a couple of new surveys that were just released. While Republicans have long been the party for those who want to conserve the past and Democrats the party for those who are more inclined to embrace change and progress, Trump has driven a gigantic wedge through that divide. Seldom have we seen a president whose message to voters is so clearly, 'If you can’t stand what our country has become, I’m your man.' This is only secondarily about policies and programs; mostly it’s about culture. And it’s possible that 2016 was the last time the GOP can be successful with that kind of appeal, at least in the near future. . . But stoking anger at immigration wasn’t the whole story — it fit into a larger argument about an America that Trump voters felt had been lost. Their economic opportunities are more limited, their communities aren’t as vibrant as they once were, and the dominant culture embraces a set of cosmopolitan and socially liberal values they find alienating. Not only that, they feel, not without reason, that the culture sends them a message that their values are outdated, small-minded and in many cases simply wrong. Now add in the fact that patterns of immigration have changed in the last decade or two, where Spanish-speaking immigrants are moving beyond the places they’ve always been (California, Texas, New York) and moving into areas that hadn’t had large numbers of these immigrants before. For some people, that change has been jarring — they see signs going up in Spanish, they see people who don’t look like them in communities that used to be nearly all-white, and it seems like one more symptom of change they don’t like. Combine that with the kind of alienation older people in particular are always prone to feel from a culture that is in fact leaving them behind, for the simple reason that they’re getting older and cultures change. Their music is no longer what’s popular, current fashion trends seem stupid to them, they don’t feel comfortable navigating this new multicultural environment, and they long for a time when they were young and on top of the world. Then along comes Trump, telling them that all those trends can be reversed. That’s what 'Make America Great Again' was about: turning back the clock to the time you look back on fondly, when it all made sense. You and people like you were in charge, creating the culture, making the future. . .
Whatever you think of their reaction, just like the broader group of Trump voters, white evangelicals are right in their assessment that their hegemonic cultural position has been eroded. It’s not just that their proportion of the population is dwindling, though it is. It’s also that the assumption that their culture is the culture no longer holds. Now they have to accommodate themselves to a diverse society, in the way everyone else used to have to accommodate to them. They really have lost something, whether you think they should ever have had it in the first place. Despite being in the minority, all these alienated voters were able to push Trump to victory in 2016". Read the Washington Post, Trump won by championing alienated white and Christian voters. But will that ever work again? UPDATE II: "The Public Religion Research Institute recently conducted a massive poll of more than 100,000 Americans. Its results go a long way toward explaining the transformation of the GOP from a conservative party into one fueled and animated by white grievance. . . In sum, if you want to know why white grievance (a burning anger about the loss of status and influence of 'people like them') and know-nothingism play such an enormous part in today’s Republican Party, look for the answer in these numbers. The views of the shrinking white evangelical population now dominate the GOP. Other polling shows that the group dismisses the extent of racism directed at minorities, immigrants, and lesbian, gay, bisexual and transgender Americans, while exaggerating the extent of discrimination against whites. It’s this group that was motivated in the 2016 election not by economics but by cultural and racial grievance, which now is at the heart of President Trump’s message . . . Trying to explore the economic dislocation associated with globalism is a worthy policy exercise. It is not, however, going to explain Trumpism, which has little to do with economics and everything to do with race. One can understand why logic and facts are no match for irrational resentment. Trump captured, stirred and magnified the animosity these voters feel about their laundry list of villains (immigrants, elites, urbanites, the media or any other sources of information that undercut their irrational views, etc.) As a political matter, it is hard to figure out how to wean people from the grip of an irrational sense of persecution and racial resentment. They are unmoved by data showing that immigrants are not harming them. They refuse to acknowledge that by every measurement, whites are not disadvantaged in our society." Read the Washington Post, The demographic change fueling the angst of Trump’s base. UPDATE: "One of the biggest mysteries of Donald Trump’s presidency has been white evangelicals’ steadfast and enthusiastic support for him. Unlike Mormons, who saw a nearly 20-point falloff in support for Trump compared with their typical support for Republican presidential candidates, white evangelicals' support for Trump was in line with, and even slightly higher than, their 2004 support for fellow evangelical George W. Bush (81% vs. 78%, respectively), according to the exit polls. And unlike Trump’s arts council and economic advisory councils, which saw so many resignations that the committees themselves dissolved, Trump’s evangelical advisory committee has seen just one resignation and is standing by their man. While many may want to simply dismiss this turn of events as pure hypocrisy, anyone seeking understanding will want to look deeper. White evangelicals branded themselves as “values voters.” That they could support Trump as strongly as Bush and more resolutely than arts and business leaders ought to serve as a signal that something dramatic has happened in the interim. . . The engines of white evangelical decline are complex, but they are a combination of external factors, such as demographic change in the country as a whole, and internal factors, such as religious disaffiliation — particularly among younger adults who find themselves at odds with conservative Christian churches on issues like climate change and lesbian, gay, bisexual and transgender rights. As a result, the median age of white evangelical Protestants is now 55, and the median age of religiously unaffiliated Americans is 37. While 26% of seniors (65 and older) are white evangelicals, only 8% of Americans younger than 30 claim this identity. The evangelical alliance with Trump can be understood only in the context of these fading vital signs among white evangelicals. They are, in many ways, a community grieving its losses. 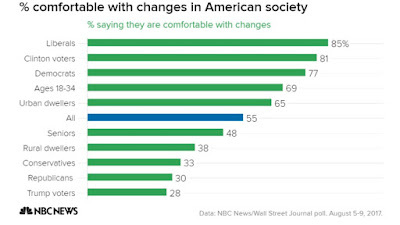 After decades of equating growth with divine approval, white evangelicals are finding themselves on the losing side of demographic changes and LGBT rights, one of their founding and flagship issues. . . Thinking about white evangelicals as a grieving community opens up new ways of understanding their behavior. Drawing on her interactions with dying patients and their families in the 1960s, psychiatrist Elisabeth Kübler-Ross identified at least five common “stages” of grief, which have become staples of understanding responses to loss: denial, anger, bargaining, depression and acceptance. As Kübler-Ross found, when the stubborn facts of one’s own demise don’t yield to denial or anger, people commonly attempt to make a grand deal to postpone the inevitable. While there are some lingering pockets of denial, and anger was an all-too-visible feature of Trump’s presidential campaign, thinking about the white evangelical/Trump alliance as an end-of-life bargain is illuminating. It helps explain, for example, how white evangelical leaders could ignore so many problematic aspects of Trump’s character. When the stakes are high enough and the sun is setting, grand bargains are struck. And it is in the nature of these deals that they are marked not by principle but by desperation." Read USA Today, Fading white evangelicals have made a desperate end-of-life bargain with Trump. Today, roughly three-quarters (73%) of the Republican Party is white Christian, but fewer than one-third (29%) of the Democratic Party identifies this way. . . Previous polling from PRRI showed how these messages resonated with white voters. After the election, fully two-thirds of Trump voters told PRRI the election represented 'the last chance to stop America’s decline.'" Read the Washington Post, The stark racial and religious divide between Democrats and Republicans, in one chart. UPDATE: Read also the Daily Mail, 'Daddy, can I come with you?' Trump makes toes curl with cringe-worthy Ivanka story before he parades his 'honey, baby' daughter on stage in North Dakota. I'm not sure if this is funny, scary, or creepy! "During a speech about tax reform in North Dakota on Wednesday afternoon, President Trump recognized local lawmakers from both parties, a major GOP donor who made billions in the oil industry and his eldest daughter, Ivanka Trump, who works in the White House as one of his top advisers. As the president's 35-year-old daughter made her way up to the stage, Trump kept talking. Ivanka Trump — a successful business executive in her own right who wrote a book about how women can advocate for themselves in the workplace -- flashed a huge, toothy smile as she walked onto stage and shook her father's hand. Throughout her father's career and now in the White House, Ivanka Trump often makes seemingly impromptu appearances like this one, stopping by her father's office during interviews with prominent political journalists or meetings with congressional leaders. With a wave, she prepared to turn the stage back over to her father and boss, the president of the United States. 'Thank you, honey. Come,' Trump said, reaching for his daughter and pulling her in for a kiss on the cheek before she left the stage. 'And she means it,' Trump told the crowd. 'Believe me.'"